This journey is fully characterized by Alto de perdón (The peak of Forgiveness). To climb it requires a calm and constant pace and its descent requires extreme caution. The exit from Pamplona, ​​through the university campus, is very clean and interesting. In between, small and peaceful spots which, look like islands floating between cereal fields. The wind can play tricks on the eyes. At the end of the day, in Puente la Reina the pilgrims of the Camino Aragonés merge with those from the Camino Navarro. Those who wish to take the time to visit the church of Santa María de Eunate need to deviate from the route here. The Camino of Santiago leaves Pamplona across the campus of the University of Navarra, a leisurely stroll to the river Sadar, which is crossed on the Acellas Bridge. The next town on the pilgrimage route is Cizur Menor, which is reached along a pedestrian, next to the road. Cizur Menor is a residential area near to Pamplona. The signposts in this area can be misleading because, for some unexplained reason, some signs guide the pilgrims to local businesses and not the city of Santiago itself. The best reference point for leaving Cizur Menor is the sports ground. After leaving the centre, and having advanced through an area of ​​developments, the pilgrim gradually gains altitude travelling through a green and yellow desert until the entrance to Zariquiegui. A picnic area on the right of the trail offers the opportunity for a rest before arriving at the church of San Andrés, of Romanesque origin, although reformed over the years. In Zariquiegui you will find La Posada de Ardogi, which operates as a private albergue, bar and restaurant. In this small and windy village, at the foot of mountain, the pilgrims can replenish reserves in Mertxe Tiendica, a small shop in which most things are stocked. The peak of perdón The route crosses through Zariquiegui via calle Camino de Santiago from which begins the feared ascent to the top of Alto de Perdón along a dirt track. This mountain is one of the most famous on the Camino of Santiago. The difficulty of its climb depends upon each individual pilgrim. The ascent (2.4 km), despite involving some steep slopes, it is not too difficult if you take things steadily, gradually gaining meters. Without doubt many pilgrims will suffer and reaching the summit becomes genuine martyrdom. The proximity of the blades of the wind turbines produces a sense of anxiety, aggravated by the wind, which tends to be quite violent in this area. Before reaching the summit, the pilgrims encounter a fountain, Fuente de La Reniega. One of the most famous legends of the Camino de Santiago speaks of the devil appearing to a young pilgrim, suffering from exhaustion and dehydration while climbing the summit. The devil offers the pilgrim water in exchange for renouncing God. The pilgrim refuses the offer. The devil continues trying to tempt the youth, take back your belief in the virgin and satisfy your thirst. Again the pilgrim refuses. Finally, the devil asks the youth to lose his faith in Santiago. Once again he denies. Suddenly an apostle appears and demands that the devil quenches the thirst of the pilgrim. "Where the wind crosses with the stars"
Alto de Perdón is named after an ancient XIII century basilica dedicated to Nuestra Señora del Perdón (Our Lady of Atonement), desecrated by Napoleon's troops. It is believed that the pilgrims on route to Santiago that reached this point would be freed of their sins but would perish in an attempt to reach the capital of Galicia. The image of the Virgin would lead to safety, this image can be found in the church of Astrain. Today, a plaque recalls that at the time there was also a hospital that attended to pilgrims. Since 1996, one of the great symbols of the Camino de Santiago has been the sculpture by Vincent Galbete, immortalized pilgrims in steel on their way to Compostela. 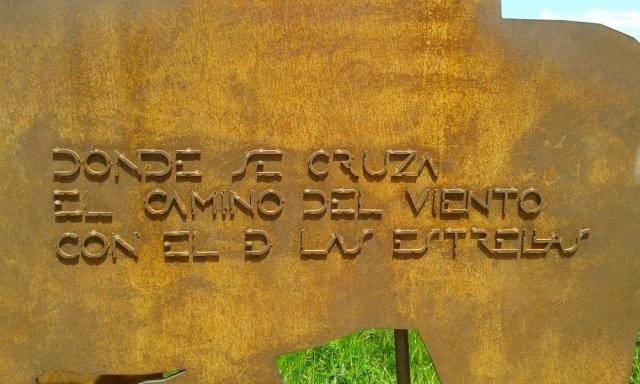 In one of the figures that make up the work of art you can read: “Donde se cruza el camino del viento con el de las estrellas.” (Where the path of wind crosses with the stars.) From the summit you can enjoy spectacular views. In addition, several signposts give directions and distances to various world capitals like New York or Cape Town, but for the pilgrim the most important is Uterga, the next destination, 3.6 Kilometres in distance. The descent to Uterga If the ascent of Perdón requires some physical effort, going down is not easy either. The descent to Uterga is another critical point on the Camino de Santiago. The ground is very irregular, not ideal for existing injuries. You should exercise extreme caution and, during the more difficult stages, you should thoroughly examine the best points in which to support your next footstep. This stretch is strongly discouraged for cyclists. The best alternative is the national road. The entry into Uterga offers shelter after passing through the sierra. Behind, and in the distance, the windmills can be seen. Uterga has barely 200 inhabitants and a laid-back way of life that is very much centred on the Camino of Santiago. Descend down a dirt track that runs to the right of the road and leads to the town. A short and comfortable walk to Muruzábal among cereal fields. The relaxed Muruzábal enclave has a chemist, Doctors surgery, a small shop and a bar-restaurant, Los Nogales Bar-Restaurant (serving a menu of the day). In the village the palace of Muruzábal, which now is home to a winery, and the church of San Esteban stand out, a monument between Gothic and Baroque in style. The deviation to Eunate In the council of Eunate, although somewhat diverted from the French Way (2km), is the church of Santa María de Eunate. In the village there are several signs that indicate how to get to this temple, although it is somewhat complicated. It is worth asking a resident of the area to avoid getting lost. Eunate Santa María is one of the most peculiar and mysterious temples on the route. It tells of a tradition whereby those who walk around the building three times are freed from their sins. Dated 1170, some historians relate its construction to the Knights Templar, and its most peculiar feature is on the eighth floor, a gallery with 33 arches. Historians believe that this area could have been an ancient cemetery for pilgrims (recent excavations uncovered skeletons with scallop shells), now somewhat diverted from the French Way, the Camino de Santiago proceeds to Somport having embraced this Romanesque jewel. Amenities in Óbanos Óbanos, very nearby, towers over the land and heart of Navarro. Access to this town, because of its location, is a little uncomfortable. Óbanos has under a thousand habitants in total (this figure is multiplied during the summer), however, unlike many other similar sized towns, streets exude life beyond that of the Camino de Santiago. It is common for pilgrims to come across lots of children playing on the swings in the city park or find the locals enjoying the wonderful wines of the area whilst playing Mus, a challenging yet popular card game, one of the preferred pastimes in this area. In Óbanos one of the main features is the Church of San Juan Bautista, of gothic style, built in 1912 using materials from an ancient temple that originally stood on the same site. Despite its proximity to Puente la Reina, Óbanos has many services, such as a health centre, a chemist, cash machines, a library with internet access, small shops like Jose Mari Self, (with a drinks machine at the entrance) and Food Nieves, a bakery, a number of bars and the restaurant Ibarberoa, with a daily menu at 9.50 euros. In Óbanos you will find USDA a privately run hostel. Alternatives for the night are the holiday apartments Raichu and the rural hostel Mamertu. The mystery of Óbanos Legend has it that Princess Felicia of Aquitaine, in order to delay her wedding, arranged by her father, undertook the pilgrimage to Santiago de Compostela. On her return, she decided to settle in Óbanos and worked as a servant for a noble house in the area. Her father, concerned about her delay sent his son Guillen in search of her. Guillen, upon discovering that she was working as a servant and out of her home territory went out of his mind in anger and killed Felicia by plunging a dagger into her heart. Repentant, Guillen embarked on the camino of Santiago as a pilgrim. On his return, he retired to the nearby shrine of Arnotegi to assist pilgrims until his dying days. On every even year, during the week of July 25th, Saturday to Saturday, the town performs a spectacular play in the village square in which more than 500 actors, both professional and villagers partake. During the thirteenth century, the town of Óbanos hosted many meetings of the Boards of The Noblemen. The middle and lower nobility of that time, the clergy, and bourgeoisie joined to form a democratic organization to ensure their rights against the abuse of the monarchy in the form of taxes. Their motto, "Pro liberate patria gens libera state" (Supporting freedom of the homeland will lead to free people), an expression coined by the noblemen that shines in the palace of Navarra, in Pamplona. The Camino of Santiago leaves Óbanos along a trail that goes down to the road. After crossing the road, walkers arrive at the chapel of San Salvador, which according to historical documents is the place that founded the joining together of two caminos, the one beginning in Roncesvalles with that which begins in Somport (Aragon). However, since the eighteenth century, this fusion has occurred in Puente la Reina. Access to Puente la Reina is along the left side of the N-111. At the foot of this busy road, a few meters from the hostel, there is a statue commemorating the union of the two paths with the inscription. "And from here all the routes to Santiago will be made one." Those who wish to read this inscription are asking to be run over due to the location of said statue. The climb to Alto del Perdón has its complications. The ground is uneven but good legs and an even pace should be more than sufficient. However the wind can also cause problems. Alternatively there is always the option to take the main road. The descent from the top of Alto de Perdon is extremely dangerous. Steep slopes and stones of all sizes turn the decline into a mission impossible for cyclists. Take the road to Óbanos. 1 reviews Distance to Santiago: 707 km. 2 reviews Distance to Santiago: 703 km. 1 reviews Distance to Santiago: 691 km. 1 reviews Distance to Santiago: 687 km.